Napa Valley is world-renowned as the California wine capital. 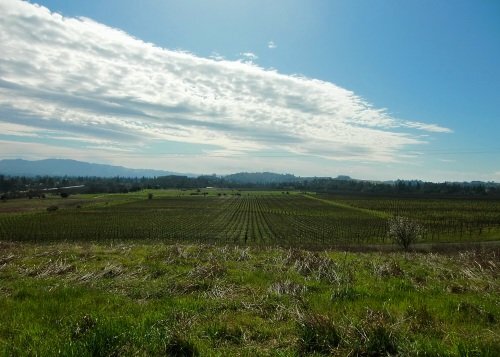 It is home to 45,000 acres of grape vineyards. Cabernet Sauvignon is the most popular grape grown in the valley, followed by Chardonnay, Merlot, Sauvignon Blanc, Pinot Noir and Zinfandel. There are approximately 850 wineries in California but just a) 4% of Califoria’s wine is produced in Napa Valley. To learn more fun facts about Napa wine production, check out NapaVintners.com. I took the photo above on a recent trip to Napa with my sister. Check out all fun we had in Tips for a Glorious Napa Valley Getaway. What is your type of wine? I’m a Chardonnay and Cabernet gal myself. Let us know in the comments! LOL. I guessed 49%. I may not fully understand the geography of the California wine industry. I was surprised it was just 4% too, Steve! And to answer your question, not nearly enough! Only 4%? Please name the other Valley’s where the production of wine is higher (including percentages). Home » BLOG » What percentage of California wine is produced in Napa Valley?